CDS Tractor Trailer Training is committed to providing professional truck driving training and job placement for students. The school has more than 18 years of experience as well as an experienced workforce. Full-time classes are available for four weeks. Part time classes are available for ten weekends. Driver training classes are offered for Class A and Class B Licenses. There are also many funding options and guaranteed funding. All students will receive a loan offer regardless of their credit, and veterans will be able to use the GI Bill to transition their military career to civilian. 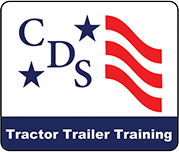 CDS Tractor Trailer Training is committed to providing professional training and job placement assistance to its students. Our workforce has many years experience in trucking, with many of those years in the training and placement of new drivers. Our school is located between Richmond and Fredericksburg in Woodford, VA. We have Full Time classes Monday through Friday from 8 am until 5 pm for four weeks. Our Part Time class runs Saturday and Sunday from 8 am until 5 pm for ten weekends. Job Placement Services are our focus from the beginning of training. Students select the carrier they desire from the many to choose from and there are NO EMPLOYMENT CONTRACTS TO SIGN! We are there to assist with applications, answer questions, and guide students to a carrier in which they will be happy. New drivers earn $38-45,000 plus in their first year! CDS has 12 tractor-trailers and 8 full time instructors. This allows students more truck time and better quality training. Most schools operate with 1 or 2 trucks and 1 or 2 instructors trying to train 10-15 students. At CDS, students train in small groups of 1-3 students per truck and instructor. It is a very good idea to visit a school to observe the training and talk to students before choosing a training program. You are welcome to visit CDS!